« Fly Fishing On Taneycomo Is Still Great! Now I know why they say “spastic as a March hare” They must have been thinking about the weather! Past couple weeks, the weather has been that way! Last Monday it was in the 30s with 30 mph winds. Yesterday is was in the low 70s with very little wind. We are looking at 60s tomorrow, then 40s Tuesday. Good news, by the weekend, back into the 60s and 70s through Monday. No moisture chances except for this coming Tuesday. Generation schedule not quite what they projected over the weekend. No generation today….wrong! One generator on at 7:00 a.m. and it is still on. Projection for tomorrow says one low for a while in the a.m. then off for 5-6 hours and back on in the late afternoon. As always, we’ll see. Stan on the water last Monday with Dean and Chris from Oklahoma. If it was warmer than 30 degrees in Oklahoma, I think they wished they had stayed home. It was bitter on the river, but they stuck it out for the day. Terrible weather to get introduced to fly fishing! They had a good day on the lightning bug with a ruby dropper. Tuesday was definitely warmer. Darrell had Bob from Canada out for half a day. Good day fishing on the Primrose & Pearl midge. Tom and his daughter, Taylor, spent half a day Wednesday on the water with Carolyn. Fun day for us. New experience for Taylor and she did very well. Good day for father/daughter on the P&P, or ruby dropped from the lightning bug. Thursday, Gina introduced David, and his two daughters, Rachael and Megan to fly fishing. They had a great day learning and catching on the primrose & pearl midge. 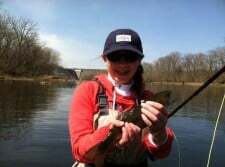 This entry was posted on Sunday, March 31st, 2013 at 2:16 pm	and is filed under Fishing Reports. You can follow any responses to this entry through the RSS 2.0 feed. You can leave a response, or trackback from your own site.